Looking for their first cricket series win against Pakistan on their turf, India today said they were approaching tomorrow’s decider with a “positive frame of mind”, recalling that they have always had the better of the home side in crunch situations such as those in various World Cups. If India was the team that was up against it on the eve of the fourth one-dayer, it’s Pakistan that is seriously short on momentum on the eve of the series decider. Speedster Shoaib Akhtar’s bout of “illness” during the crucial fourth one-dayer against India is “disturbing” the Pakistan team management which desperately needs the bowler to be in top form for the deciding one-dayer against India here tomorrow. 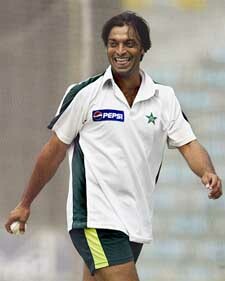 Shoaib Akhtar smiles during a training session in Lahore on Tuesday. Pakistan coach Javed Miandad says he is not surprised by the “whispering campaign” about the fourth one-day match against India being fixed as it was common for such rumours to float every time his team lost a match. Warming up for a grand finale (from left to right) — Inzamam-ul Haq bats at the nets, Mohammad Kaif fine tunes his fielding skills and Virender Sehwag, Zaheer Khan (c) and Lakshmiapati Balaji (r) play handball during a training session in Lahore on Tuesday. Cricket fans leave for Pakistan. England completed a seven-wicket win over the West Indies early on the fifth and final day of the second Test today to take a 2-0 lead in the four-match series. Needing a further 28 runs for victory, England lost Nasser Hussain for five to the second ball of the morning. Promising youngster Prakash Amritraj, son of former Davis Cup ace Vijay Amritraj, is back in the Indian Davis Cup team for the second round Asia Oceania Group I tie against Japan, to be played at Osaka City Utsubo Tennis Centre deco-turf court in Japan, from April 9 to 11. The sixth PGA Cup Punjab golf championship, will be held at the RCF Golf Club, Kapurthala, on April 3 and 4. Competition will be held for amateurs with handicap of nine and below. Senior golfers (65 years and above) with a handicap of 18 and below will also participate on April 4 and play 18 holes. Punjab Sports Club, Faridabad, defeated Army Eleven, Pathankot, 3-1 while B.E.G. Roorkee defeated City Young, Dehra Dun, 2-0 on the second day of the 37th All-India Ballarpur Industries Football Tournament being played at Paper Mill stadium here today. Vice-captain Rahul Dravid said on the eve of the fifth and final one-dayer here the Indian team had worked on the grey areas and would try to play to its full potential in the decider of the five-match series tied 2-2 at the moment. “It is true that we have not done so well in finals, but it is mainly against Australia. We had not played to our full potential in the past and we are aware of it. If we play to our full potential, the result will take care of itself,” Dravid told a pre-match press conference here. But Dravid was quick to point out that the Indians had done very well against Pakistan in crunch matches in the past and would be keen to keep the trend going. “We have not done well against Australia in the finals, but we probably have better results against Pakistan. We have to go into the match with a positive frame of mind,” he said. Dravid said the team had prepared well for the series-decider and had analysed the problem areas. Asked whether the team management was contemplating making changes to the team for the last match, he said “we have decided to retain the 12 players who played the last match. The final eleven has not yet been decided”. The Indian vice-captain admitted that the absence of regular bowlers like Anil Kumble, Harbhajan Singh, Ajit Agarkar and Ashish Nehra had made the Indian bowling attack rather inexperienced. 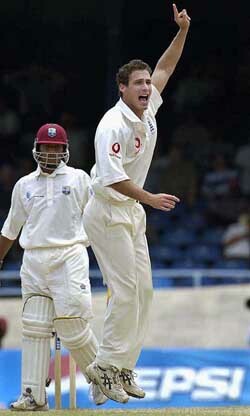 “We obviously miss such experienced bowlers. Our bowling lacks experience as we have some young guys. But you can’t use that as an excuse always. Lot of international matches are being played nowadays, and teams have to play even if your main bowlers are injured,” Dravid said. On Pakistan fast bowlers conceding a large number of extras right through the series, he said, “we are happy to receive that kind of help (of conceding runs through extras). Their pace bowlers come hard at us and are aggressive. Sometimes it can go against them”. If India was the team that was up against it on the eve of the fourth one-dayer, it’s Pakistan that is seriously short on momentum on the eve of the series decider. Inzamam will have to decide first on what he wants from his openers — a solid start or an explosive one. Shahid Afridi will provide the latter every now and then, but he also fails pretty regularly. Every time Afridi fails to fire, the Pakistanis find themselves unable to score rapidly in the first 15 overs. The other decision the Pakistan thinktank make immediately, irrespective of which way this series goes, is to appoint a bowling coach. The captain, coach and manager are all batsmen, and the bowlers just don’t have anybody to help them sort out their no-ball and wide problems. This was not the case in the past. I guess former greats like Wasim Akram and Waqar Younis had me to help them at the start of their career, when I was captain. Our bowlers are a talented lot, and with a little help they can become a deadly combination. It was really unfortunate to watch three wickets off no-balls as this meant that the bowlers had to dismiss the cream of the Indian batting twice. Shoaib Akhtar bowled a great opening spell, and it is thanks to him that India lost four wickets by the time they reached 100. However, regular wides and no-balls ensured that the visitors always had a run-rate near seven. 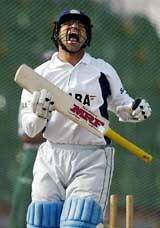 I also thought Inzamam did not attack enough, letting both Dravid and Yuvraj take easy singles in the middle overs. There was a good enough cushion of runs for him to have attacked, but his fielders were all saving runs. A lot is being said about the dew factor, but a professional team would have checked these conditions out before the game began. Being the hosts, it is shocking that no one in the team knew that bowling will be difficult in the evening. A wet ball does not seam, swing or spin and in such conditions it is a cardinal error to opt to bat first. Even if there is dew only in the last hour of play at night, it can help the batsmen hugely. I met the Pakistan players for a fundraiser at the Shaukat Khanum Memorial Cancer Hospital last night, but we did not talk cricket then. I might go down to the dressing room tomorrow to have a chat with them, just before the match. I don’t think the Pakistan batsmen scored enough runs at the top of the innings because of the loss of two quick wickets. Yousuf Youhana is also looking a little under the weather, and except for his knock in the Karachi game, does not have much to show for himself in the rest of the series. His dismissal prevented the hosts from capitalizing fully against an attack that, in the absence of four regular bowlers, looks the weakest in world cricket right now. Having said that, the Indians made the most of their limited resources by bowling to a plan. Murali Kartik was effective because he stuck to his plan of bowling over the wicket, while Pathan was really pretty accurate at the start of the match. However, my Man of the Match was Rahul Dravid, who ensured that the runs kept coming even while keeping the impetuosity of Yuvraj and Kaif under control. Captain Inzamam-ul-Haq and coach Javed Miandad were apparently upset over the latest illness to their strike bowler as they explained his absence from the field in the middle of India’s run chase here on Friday, according to a report in the daily ‘The News’. Inzamam said Shoaib had a spell of dizziness and had to go off the ground. Sources within the team were quoted as saying Inzamam and Miandad were not happy over the incident. “It is not the first time this has happened in the middle of a series. What is irritating is that even the team doctor and trainer have no explanation for why he suffers these sudden spell of dizziness or black-out,” sources said. “I am not surprised that we have some people again questioning the commitment of the players and starting a whispering campaign about the match being ‘fixed’,” Miandad said. “It happens every time we lose. Why don’t people say anything when we are winning matches?” he was quoted as saying in local daily ‘The News’. But despite the strong defence of his players, Miandad was unhappy with the way his team lost the fourth match after taking four early wickets and putting up a healthy total of 293 runs. 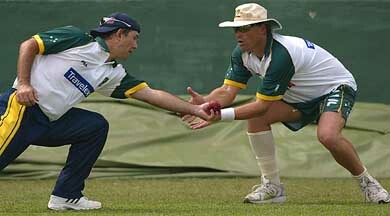 Miandad also pin-pointed at “the tendency of our bowlers to concede lot of extras” as one of the reasons for the defeat. “I think it is time they sorted out this problem with their individual hardwork,” Miandad said. “I can only work for hours with them and tell them why they are overstepping or bowling wides. But in the end it is up to them to work hard and sort out this problem. “I have done my best now they have to stand up and take responsibility. These extra runs and overs are costing us heavily,” he said. Pakistani bowlers have conceded a total of 97 runs in wides and no-balls in the first four matches of the series with Shoaib Akhtar sending down 14 wides in the fourth game on Sunday night that India won to square the series 2-2. Miandad conceded that Pakistan now had a big fight at hand to win the deciding match here tomorrow and would be under more pressure. “The situation is the same for both teams. But I think there is more pressure on us as we are playing at home. Indian captain Saurav Ganguly, who loves good food, and Information and Broadcasting Minister Ravi Shankar Prasad had a late dinner together at the famous Food Street here in the early hours of Monday. But their visit was a well-kept secret to avoid the Indian cricket team’s massive fan following in Pakistan. Prasad, who Sunday watched India beat Pakistan by five wickets in the fourth one-day game at Gaddafi Stadium, and Ganguly went to the Food Street well past midnight. “The two, accompanied by a few other people, went there at around 1.30 a.m. to avoid rush and fans,” said a source in the Pakistani information ministry. “Food Street chairman Khwaja Shakeel was with them when they had their meal,” said the source. Food Street, which is located in the Guwal Mandi area, is one of the most famous dining spots in Pakistan and home to about 300 to 400 restaurants. * When they are not piling up runs, Rahul Dravid and V.V.S. Laxman are browsing the Internet. Players like Mumbai off-spinner Ramesh Powar who do not have access to the Internet in their rooms hit the hotel’s business centres to browse the net, send e-mail and read what the press is writing about them. * Lahore’s Pearl Continental, the five-star hotel where the Indian and Pakistani teams and cricket officials are staying, is buzzing with excitement these days. Lahorites are flocking it much the same way as they hit restaurants on weekends. Youngsters with autograph books, and often cameras, can be seen hunting for cricketers — especially Indians — in the lobby because they cannot go upstairs unless they are accompanying a player. Whenever players come to the foyer or go to the restaurants on the ground floor, youngsters thrust their autograph books in their faces. Like experienced diplomats, cricketers try to oblige everyone — either with a signature or by posing with their fans. * Former Indian cricket board president Raj Singh Dungarpur, here to watch the last two one-day internationals at Lahore, said the congregation of cricket officials and players at Lahore amazed him no end. However, left-handers Mark Butcher and Graham Thorpe guided the visitors to their target of 99 for England to retain the Wisden Trophy they won at home four years ago. Butcher hit the winning runs to finish on 46 not out while Thorpe, top scorer with 90 in the first innings, struck three boundaries for an unbeaten 13. England need to avoid defeat in either of the final two Tests to seal a first series triumph in the Caribbean since 1968, having won the first Test in Jamaica by 10 wickets. Fall of wickets: 1-34, 2-45, 3-56, 4-158, 5-171, 6-194, 7-195, 8-200, 9-205. Bowling: Hoggard 16-5-48-2, Harmison 16-5-40-1, Jones 15-2-57-5, Flintoff 12-1-27-2, Giles 7-1-29-0, Trescothick 1-0-4-0. The five-member squad, led by Leander Paes, contain no surprise as the All-India Tennis Association has picked the best available talent. The team: Leander Paes (captain), Mahesh Bhupathi, Prakash Amritraj, Rohan Bopanna and Harsh Mankad. Former Davis Cupper Nandan Bal will be the coach. Dr Vece Paes has been named the doctor and Sanjay Singh the trainer. Leander Paes had played a stunning role to pip New Zealand by winning all his three matches — two singles and one doubles — a couple of months back. That was Leander’s first Davis Cup tie, after recovering from a brain lesion. India are expected to get the better of Japan without much difficulty, as the last time the teams clashed in a Davis Cup tie at Osaka in 2001, India won by 3-2. The last time the two countries met was in New Delhi in 2003 with the hosts recording a facile 4-1 victory. Interestingly, India and Japan met in a Davis Cup encounter for the first time in 1921 at a neutral venue - Chicago, USA — with Japan making a 5-0 sweep in the semi-final. Since then, India and Japan have met several times in the Davis Cup with India invariably emerging winners. And Leander has only fond memories of the tie against Japan in Chandigarh in 1990, when he made his sensational debut. Leander has not looked back since then, guiding India to many a memorable Davis Cup victory. PGA will offer cash incentives to the state champion, the first runner-up and the second runner-up. Col. H.S. Baidwan (retd), Senior Vice-President (Tech.) of the Punjab Golf Association, also announced that Junior and Sub-Junior golf championship for boys & girls will be held in October. In addition the PGA will also hold a 10-day golf coaching camp for boys and girls during their summer and winter holidays at Patiala, Jalandhar and Chandigarh. Entry forms for the 6th PGA Cup will be available at all golf clubs of Punjab and Chandigarh. Entries can be sent to Col. H.S. Baidwan (Retd), SCO 28, (second floor), Sector 33-D, Chandigarh, by March 29. In the first match the Faridabad team started on a fast note. Vikram of the Faridabad team missed an easy chance in the 39th minute when an Army defender could not clear the ball but Vikram missed the chance in front of the Army goal. The match ended goal-less. In the tie-breaker, the Faridabad team won 3-1. In another match B.E.G. Roorkee’s S. Malik scored a goal in the 37th minute. At half time B.E.G. Roorkee were leading 1-0. In second half, A. Bhardwaj scored in the 83rd minute to complete the tally. The Punjab Sports Department will organise two-day trials to select the players (boys) for the speed fund academy, Ludhiana at the local Guru Nanak Stadium on March 25 and 26. Players, studying in the schools and colleges, between age group of 13 to 21 years are eligible for the trials which begin on Thursday at 8 am.